If all you know of Tinker Bell is the spot of light in the play or the wordless sprite in the 1953 film, the modern Disney machine has transformed her into, wait for it, a tinkerer. In a 2008 reboot and many subsequent movies, books, games, etc., Tinker Bell is now a representative of a race of fairies that live in Neverland. These fairies each have a talent, and Tinker Bell’s is to tinker. There’s a whole tribe of tinker fairies who craft and make all the tools and equipment of fairy civilization. Tinker Bell the character is a role model for young tinkerers. She’s ambitious, undaunted, mechanically inclined. She is an experimentalist. She works with natural and manufactured materials, particularly scrap and junk. She faces regular setbacks, learns from them, and builds again. She communicates about her creative process, the inventions she makes, and why they are useful. She loves tinkering, treats it as an integral part of herself, but also has time and attention for friends and other pursuits. Tinker Bell stands out for her wanderlust, creativity, and inventiveness. Discontent to hammer out cooking pot after cooking pot, as her fellow tinker fairies do, she tries to invent new and better ways for the other fairies to do their work, be that painting spots on ladybugs or cracking open nuts. She breaks taboo and tinkers with junk items washed up from “the Mainland,” as these stories call our world. So far, so good. The plots are fully supportive of Tinker Bell’s tinkering. Often some aspect of her inventions go awry, but she fixes them with more tinkering and saves the day. Other fairies admire her skill. But as a Disney Fairies property narrowly targeted at girls ages 7-12, the bulk of the story focuses on friendship between girls, in good moods and bad. The films have a huge preponderance of white female characters who are focused on fashion, color, cute animals, and other stereotype-reinforcing girl behavior. While the fairy population overall seems to be overwhelmingly female, in Tinker Hollow there’s a distinctly higher proportion of male fairies. Disney doesn’t seem to know what to do with its central character’s central characteristic. 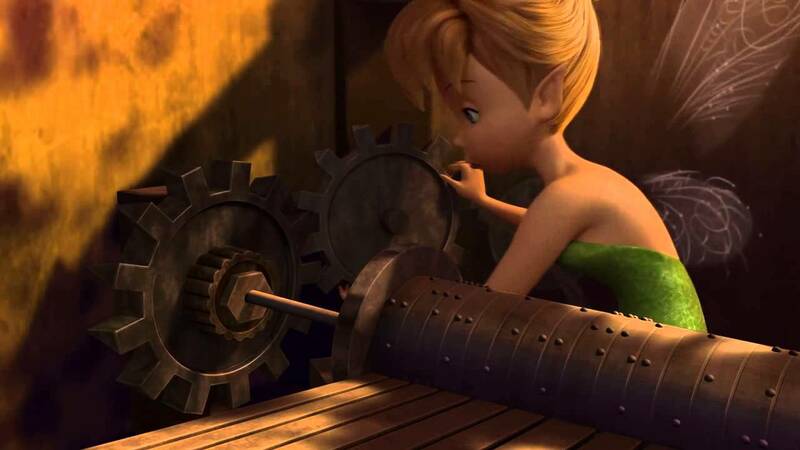 The stories all have some aspect of Tinker Bell inventing or tinkering to save the day, but often squeezed into a small part of the plot, particularly as the series evolves. The marketing and accessories focus on fashion, collectibles, and figurines, typical branding stuff but nothing related to Tinker Bell as a tinkerer. 7-12 year old girls is a perfect demographic for tinkering. This is the age where naturally playing with blocks, crafting, and construction toys fades and if more intensive modes of making aren’t introduced, kids move onto new interests, from books to sports to videogames. reDiscover sees this age as vital to bridging children from innocent exploration of the material world to mature engineering and artistry in a fully engaged STEAM curriculum. At the same time, this is an age where children’s interests explode in new directions, social, physical, and intellectual. Using Tinker Bell to connect girls (and boys!) to tinkering as an activity piggybacks on Disney’s impressive storytelling and marketing efforts. There’s an opportunity here for enterprising parents and educators. Watch the movies together. Boys and girls. Talk about what Tinker Bell does: improving on the things she sees around her using the materials at hand. Talk about how she does it: with her own skill and tools, with or without the support of her peers, on her own time. Talk about why she tinkers: a combination of internal urges, pride of skill, and a desire to help. For older children, talk about female tinkerer role models like Ada Lovelace, Margaret E. Knight, and Grace Hopper. Make a Tinker Hollow of your own, a zone of your home where materials and tools can collect and your children can create, invent, and tinker.